RARE Cameo Jefferson! 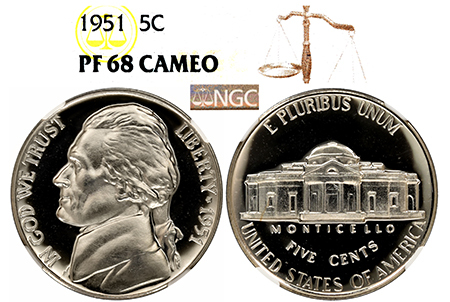 Extremely difficult to find in Cameo condition, this 1951 Jefferson beats the odds despite being an early-date nickel! Mirrors that are blacker-than-black, deep, and flawless to the eye create the perfect mirrored background for frosted, snow-white devices. No haze, just pure black-and-white contrast! 1 of only 104 graded by NGC.